Take part in this short-getaway horseback riding excursion in Mexico! The most complete way to experience the canyon both by day and night is to do this overnight adventure. 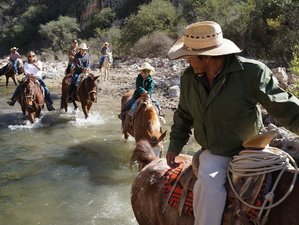 This program includes the visit to the ranch, the horseback riding excursion, and free time to explore the canyon, as in the half-day and full day rides, and also enjoy swimming, roping lessons, and night and early morning rides. You will be camping in Boca de la Cañada community. The camping includes all camping gear (tents, sleeping bags, folding chairs, etc), four campfire meals (complete with ice cold beers for the adults and marshmallows and hotdogs for the kids at night), a long evening bonfire, and clear skies, permitting fantastic stargazing. You can sleep in tents or Coyote Canyon Adventures can arrange their stone cabins for you. The total duration of the riding trip is 27 hours. You start at 08:30 and you will get back into downtown the next day at 11:00. On the first day, you will start the excursion visiting a ranch and learning about daily activities such as hand-made tortillas and traditional Mexican sauces making. You will search for eggs for your breakfast and, after having breakfast, Coyote Canyon Adventures will take you to Boca de la Cañada community where the horseback riding adventure will start and your camp is located. This horseback trail riding excursion gives you enough time to take a midnight ride all the way to a neighbouring village, where you can stock up on some essentials, or pick up a good tequila to help keep the stories flowing around the campfire. For the more extreme riders, this horseback trail riding excursion also includes a section where you can gallop or even race full speed through the darkness! Of course, that part is optional and not recommended for the faint of heart, although it is actually very safe as horses have excellent night vision and both the horses and your guides know by heart every twist and turn of the trails you ride on. On the next day, after breakfast, you will continue discovering the great canyon and the natural landscapes before going back to San Miguel downtown. You can complete your adventure relaxing in the favorite hot springs (not included). San Miguel de Allende is undoubtedly one of Mexico’s most beautiful colonial towns and has been named a national monument. Its rich history dates back over four hundred and fifty years. San Miguel is a town which has art running deep within its veins and plays host to an incredible variety of celebrations, festivals, and events, as well as world-class concerts and theatre productions. For those who enjoy fine dining, dancing, and shopping, San Miguel will surely be keeping you very busy with its colorful assortment of restaurants, night-life, boutiques, art galleries, pastry shops, and markets. So, if you’re ready for great family fun, a fresh idea for corporate incentive travel, awesome adventures, or a special romantic getaway, call Coyote Canyon Adventures today! This beautiful colonial town is a UNESCO World Heritage site, a place of great magnetism, where general Ignacio Allende formed the army that rose up against Spain during the War of Independence. Hence, San Miguel’s designation as “the forge of Mexican independence”. San Miguel is a magical town with precious colonial, baroque, and gothic architecture that brings one back to the era of the viceroyalty and the Mexicans’ fight for liberty. San Miguel de Allende is located in the mountainous, semi-arid region of central Mexico, in the eastern part of the state of Guanajuato, 60 kilometers from the city of Queretaro, 100 kilometers from the capital of Guanajuato, 150 kilometers from León and the airport, and 300 kilometers from Mexico City. Meals served along with this overnight horseback riding excursions consist of traditional Mexican dishes and fresh organic ingredients grown and collected right on the ranch. A typical meal might be a plate of potatoes and eggs, accompanied by a serving of rice and baked beans, plus quesadillas made with the home-made cheese which is produced on the ranch fresh every day, just like the corn tortillas. You may also be served fresh salsas, cactus salad, guacamole, and fruit with your meal. The meals are vegetarian friendly. The overnight tour includes four meals. Coyote Canyon Adventures is a family-owned destination management company specializing in adventure and ecotourism as well as motorcycle tours.